Fresh cornbread to share, a bottle of pepper sauce within reach, and yes, macaroni-n-cheese counts as a "vegetable" here. 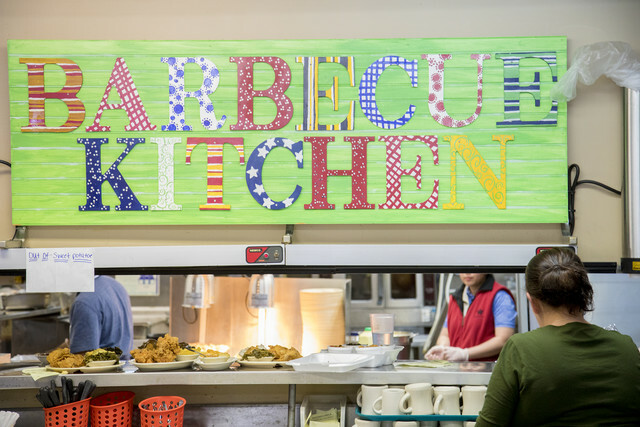 The Southern Vegetable Plate is just as quintessential of a Southern dish as fried chicken and cornbread. A divergence from the traditional meat-and-three plate, this dish substitutes your meat portion (often barbecue or smoked chicken) with an extra helping of veggies. Sounds unheard of, right? Not so! Plants have long dominated the dinner table in the South, playing center-stage and flexing their flavors with nothing more than a bit a bacon or ham stirred in, if any meat at all. The offerings are variable and some shift with the seasons; from fresh sliced tomatoes and buttery corn on the cob in the summer to sweet potato casserole come fall and winter. Hardy greens simmered in their own potlikker frequent the menu year round, as do sticky-sweet baked beans, cole slaw, smoky black-eyed peas, and potatoes served au gratin or mashed and topped with a pool of gravy. There's likely a casserole of sorts somewhere, and cobbler or puddin' waiting for you after you clean your plate. 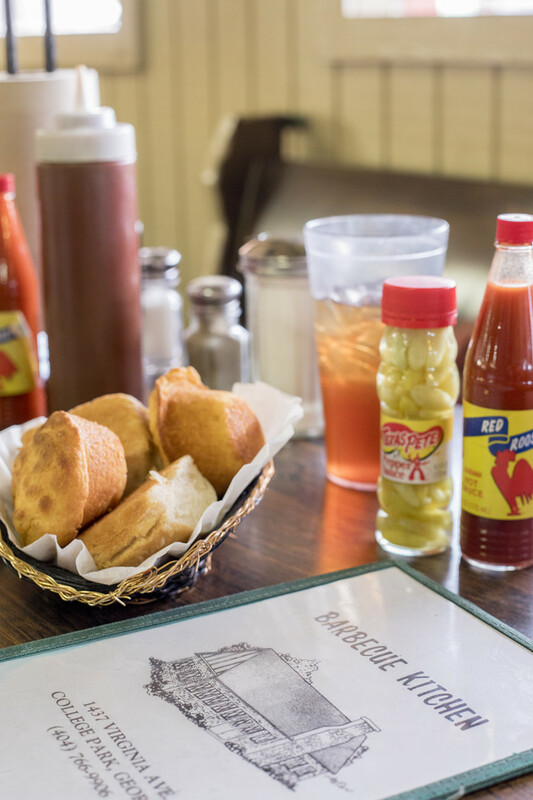 As a rule, there should be a basket of biscuits or cornbread (or both!) at the table, as well as a selection of pepper sauce and relish so you can jazz up your beans and greens as you please. What you put on your plate is totally up to you, and while variety is the spice of life, there's no shame in doubling (or tripling!) the portions of your favorite sides. In fact, our president, Judith Winfrey, admits to ordering "collard greens, collard greens, collard greens, and... collard greens!" growing up. 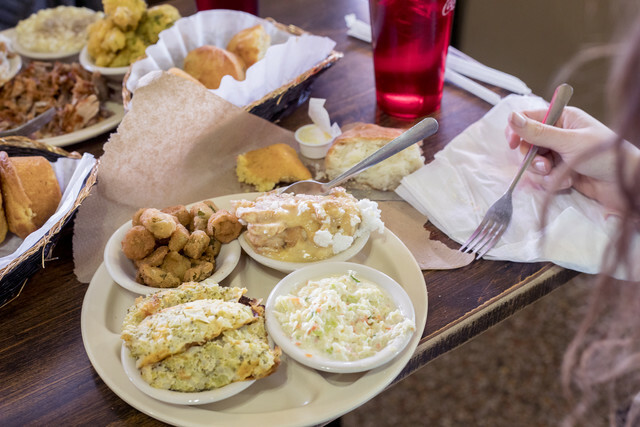 If you're a newcomer to the splendid world of Southern veggies, try balancing your plate with something fresh, something fried, something green and something beans. Kate Blohm, Photographer & Videographer - "My favorite meal used to be mac n cheese with pinto beans, served next to each other so the sauces could mix :)"
Stella Dillard, Recipe Contributor - "Field peas! Little ones in salads with lots of herbs, fresh cheese and a sharp vinaigrette. Big ones stewed with smoked pork and Trinity. Served with green beans in "egg sauce:" soft boiled eggs chopped in with lemon and red onion. With greens and cornbread on New Years, obvs. I'm the Bubba Gump of field peas." Emily Clausen, Recipe Editor & Culinary Coordinator - "Dirty rice. My mom always makes liver & giblet gravy with her chicken, so dirty rice reminds me of a roast chicken dinner!" Katie Kriner, Nutritionist - "Mac'n cheese is the best. Baked and go-big-or-go-home cheese. Don't put vegetables in it or breadcrumbs on it - all that is just plain silliness. Fried okra is cool too." Sarah Scott, Social Media Coordinator & Marketing - "Sweet potatoes - roasted, souffle, mashed, with marshmallows, with brown sugar, with ginger... anyway you make 'em, I'll eat 'em. And cornbread, the kind with corn pieces in it!" Katie Maxwell, Technology Manager - "I second Sarah's cornbread vote with the fresh corn kernels. Especially topped with some sweet butter or homemade preserves. But these days....I love collard greens. The more vinegar-y, the better! Super tangy and delicious." Staci Janik, Graphic Designer - "Fried Okra and Corn on the Cob!" Michael Milich, Customer Experience & Sales Manager - "Tomato and cucumber salad! The ultimate combination of fresh summer flavor! It will always remind me of my childhood home and Summers in Atlanta. If tomato counts as a vegetable..."
Judith Winfrey, President - "Collard Greens, Mustard Greens; both with cornbread crumbled into the potlikker. My perfect Veg Plate: Collard or Mustard Greens, Pinto Beans, Coleslaw (not too mayonnaise-y, just a little vinegar on fresh and finely chopped cabbage) with cornbread and a sweet tea (usually half and half these days because they make sweet tea too damn sweet now)"
Seth Freedman, Culinary Director - "GREENS! All kinds...especially with a proper potlikker and finished with pepper sauce. Also love butter beans, leather britches, and mashed potatoes." Southern veggies on the menu tonight? Check out these recipes!